The Scandinavian Egg (also known as Quisling Egg) is made of translucent strawberry red, white and matte yellow enamel, red and green gold and suede for the yolk compartment fitting a naturalistically enameled gold hen, painted in shades of brown with touches of white and gray. Diamonds are used for the eyes of the little hen. 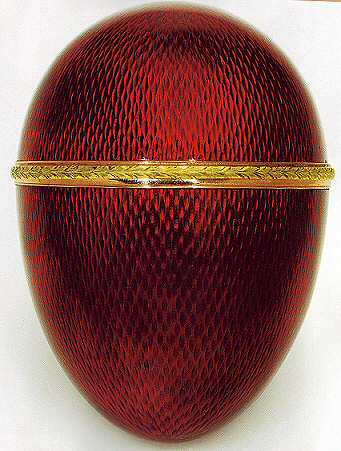 This Egg is one of a series of "hen and egg" creations by Fabergé of which some have survived. 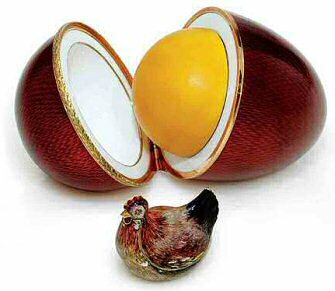 Best known is the 1898 Kelch Hen Egg which closely resembles this one, but for the fact that it lies on is side and is embellished with diamonds. Other naturally shaped Easter Eggs are the 1885 Imperial Hen Egg and the Lapis Lazuli Egg, the latter containing a crown in its yolk. The Scandinavian (or Quisling) Egg was rediscovered in 1980 in an Oslo Bank safe among the effects of Maria Quisling (1900-1980), the widow of Vidkun Quisling (1887-1945). Vidkun was the son of Jon Quisling, a major in the Norwegian Army who served as Military Attaché in Saint Petersburg in 1918 and 1919, where he probably acquired this Egg. Vidkun Quisling served as Minister of Defense in 1931-1933 in Norway and founded the Norwegian Socialist Pary. He became the leader of this outspokenly pro-German and anti-Semitic party and when Hitler's armies invaded Norway in 1940, he supported the Führer and even became Prime Minister in 1942. After the war in 1945, he was tried as a traitor and executed by firing squad. Nowadays the word "Quisling" means in the Norwegian and other European languages "traitor". As far as I know, end 2016, the Fabergé Museum in St. Petersburg does no longer have this Egg exhibited!